Unique braceletsThere are 32 products. Unique handmade bracelets - when you do not know how to make an emphasis on your hands or make them look even more beautiful. For women who love uniqueness, elegance and beauty. Unique handmade bracelets from Unikatnica are designed in one piece per an item only and are all made from Fimo and Cernit clay an other materials which are skin friendly and nickle-free, so that they are also suitable for people with allergies. This white flower bracelet is an elegant piece of ooak and handmade jewelry for women. It represents a unique piece of jewelry for women for special occasions. Unique handmade designer set of jewelry - red bracelet and a ring with unique, handmade pattern of dots - this set of fire red jewelry perfectly match clothes in red, black, white and many other modern colors. Important! Before ordering this fire red set of jewelry, please register/log in to Unikatnica. This really lovely and elegant black and white cat bracelet represents a unique, ooak and handmade gift for all cat lovers, especially the ones who own a cat by themselves. IMPORTANT! Before purchasing this amazing cat bracelet, register/log in to Unikatnica. This really lovely and elegant set of red cat Sphynx jewelry (a bracelet and earrings) represents a unique, ooak and handmade gift for all cat lovers, especially for Sphynx cat lovers. IMPORTANT! Before purchasing this amazing set of cat jewelry, register/log in to Unikatnica. This lovely and elegant set of Sphynx jewelry (a bracelet and earrings) represents a unique, ooak and original handmade gift for all cat lovers, especialy for Sphynx lovers. IMPORTANT! Before purchasing this amazing set of cat jewelry, register/log in to Unikatnica. 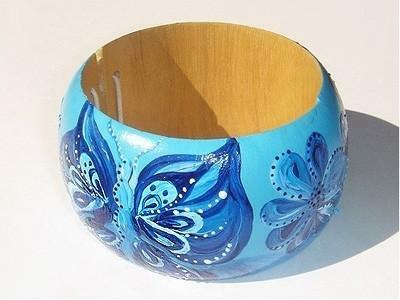 Blue unique wooden bracelet with original, handpainted motif of butteflies and flowers. The wooden bracelet is made from skin friendly materials. Before purchasing this wooden blue bracelet, please register/log in to Unikatnica. Unique wooden bracelet with original and handpainted motif of lovely flowers in orange and yellow color. The bracelet is made from skin friendly materials and is nickle-free. Before purchasing this wooden butterfly bracelet in orange and yellow, please register/log in to Unikatnica. Unique wooden bracelet with original and handpainted motif of lovely flowers in turquoise and white color. The bracelet is made from skin friendly materials and is nickle-free. Before purchasing this wooden butterfly bracelet in turquoise and white, please register/log in to Unikatnica. Unique, handmade Butterfly bracelet and a ring in cyclamen color with unique designer pattern. These Butterfly bracelet and a ring go lovely together with white, blue, cyclamen and violet clothes. IMPORTANT! Before purchasing this set of Butterfly bracelet and a ring, please register/log in to Uniktnica. Unique, handmade Butterfly bracelet and a ring in cyclamen and white color with unique designer pattern. This Butterfly bracelet and a ring go beautifully together with cyclamen, white, blue and violet clothes. IMPORTANT! Before purchasing this Butterfly bracelet and a ring please register/log in to Uniktnica. Handmade designer green flower bracelet and green flower ring for women is a unique and fashionable jewelry. These green flower ring and green flower bracelet are made from skin friendly materials and contain handmade pattern of a flower. Handmade designer jewelry: unique bracelet, unique earrings and handmade ring with unique author's handmade pattern of flowers in orange colour. The set of jewelry is made from Cernit Clay, the pattern is unique and handmade.